Each month, Doug Cope and WBZ NewsRadio 1030 select an organization to profile through its public service initiative, WBZ Cares. 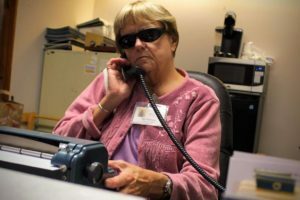 We’re thrilled to announce that WBZ NewsRadio has selected the Carroll Center for the Blind as the WBZ Cares featured non-profit during March. Tune in and listen every Wednesday throughout the month as they highlight stories about the Carroll Center. If you miss any you can listen to weekly installments below. Screen reader users can listen to the audio clips by navigating to the sites below, activating a link labeled “play,” and choosing to open the file when prompted.